As a Maine wedding photographer I always recommend booking photography from the earliest part of the day possible and makes sense. A wedding truly is an all day event and so much more that just the ceremony and reception. Often the best images come from the build up to the ceremony in the "getting ready" phase of the day. This is a time where everyone is feeling the moment and having fun together as a group. Family and friends may have come from a far and add to the excitement. There is always a feeling of anticipation, excitement and joy that is in the air which makes for some of the most dramatic and authenic images of the entire day. In this image our bride has a moment with her bridesmaids together just moments before she puts on her wedding dress. 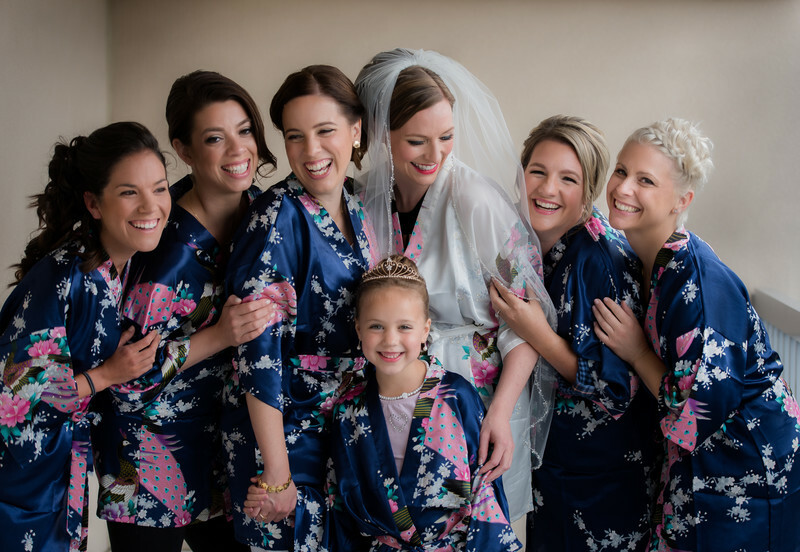 The beautiful robes were gifts for each of her bridesmaids and have a speical meaning to the day. With so much time and effort into every aspect of the wedding day it's so important to freeze these moments with photography. Photography can document these moments to spark a memory and feeling taking you back. I love this image. The light is skimming across the group and hitting each person perfectly with short lighting the bride. There is joy in the air and the expressions of happiness are perfect. Location: Hilton Garden Inn, Auburn, Maine.